There’s something about the Christmas season that lends itself to flights of fancy. This year the Hallmark Channel has several on its schedule that I only took notice of because they’ll give us all a chance to see some genre stars we may not have seen in awhile. 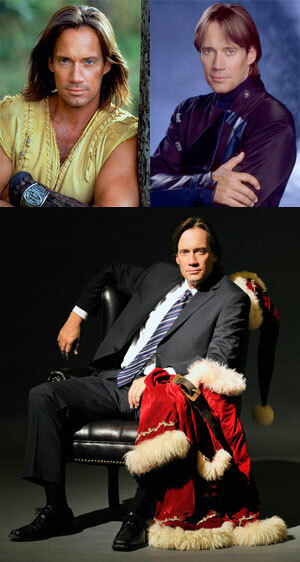 Even though I followed Andromeda, whenever I see or hear of Kevin Sorbo the phrase “Kevin Sorbo is Hercules” can’t help but run through my mind. I was a little resistant to Kevin playing the mythological hero … he’s so svelte … but I must admit he grew on me. In The Santa Suit, Kevin plays Drake Hunter, the greedy, Scrooge-like, head of Hunter Toys. Being the crass businessman, Drake sees the Christmas season as solely a means to making a profit. In a twist of fate, he is transformed into a Santa Claus by Santa himself and, of course, learns that Christmas isn’t just about making a buck. Sounds like Scrooged meets The Grinch Who Stole Christmas to me. By the way, Kevin has been in other genre fare besides Hercules/Xena and Andromeda. Including the mediocre feature film that tried to bank on his Hercules fame, Kull the Conqueror, and several TV movies, Something Beneath, Never Cry Werewolf and the forthcoming Flesh Wounds. The Santa Suit will have it’s world premiere on The Hallmark Channel on Thursday, Dec. 2, at 8pm ET/PT, 7CT. Matt Frewer is probably best remembered as the actor that brought life to the digital character Max Headroom. But he’s been an welcome face to many genre shows and films, including Star Trek: The Next Generation (“A Matter of Time” – 1991), Stephen King’s The Stand, In Search of Dr. Seuss (The Cat in the Hat), Lawnmower Man 2: Beyond Cyberspace, The Outer Limits (“First Anniversary”), Generation X, PSI Factor: Chronicles of the Paranormal, Taken, Dawn of the Dead, Masters of Horror (“Chocolate”), Eureka, Watchmen, Alice and a memorable stint as Pestilence in Supernatural. He’s also lent his voice to numerous animated series with genre themes. In Battle of the Bulbs, Matt plays Stu. Stu and his ex-friend Bob have had a years-long feud after a falling out. 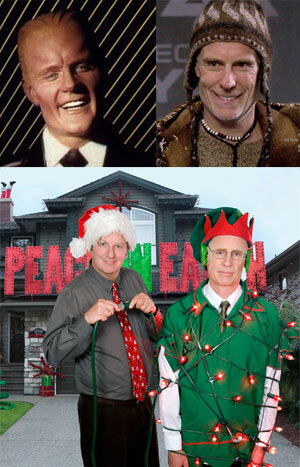 In what sounds like an homage to National Lampoon’s Christmas Vacation, Bob and Stu try to out-decorate their homes for Christmas. What makes it worse is that Stu’s son has fallen in love with Bob’s daughter. Battle of the Bulbs will have its world premiere on the Hallmark Channel on Saturday, Dec. 18, at 8pmm ET/PT, 7CT.